 Whether you are designing your new beach house or updating an existing structure at your oceanside home, the team at your local Swenson Granite Works store can guide you in choosing products that will withstand the harsher elements of a coastal location. Let’s take a look at a few durable and long-lasting building materials commonly used for residential projects on the Northern Atlantic Coast. Granite is a popular material for coastal homes and beach houses because of its durability and appearance. While materials like wood, brick, and concrete are often damaged by freeze-thaw cycles, granite handles challenging coastal climates and requires minimal maintenance. 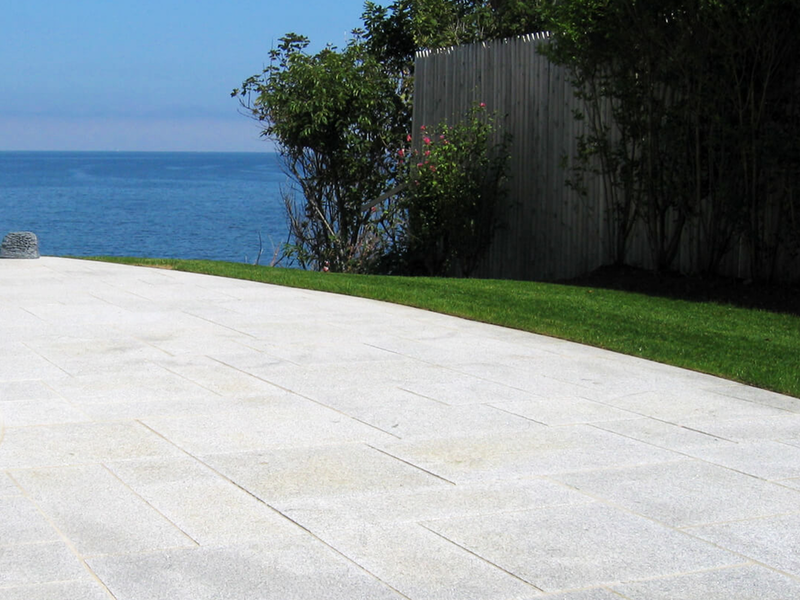 From steps to patios, Swenson’s granite can elevate the appearance of any coastal home. 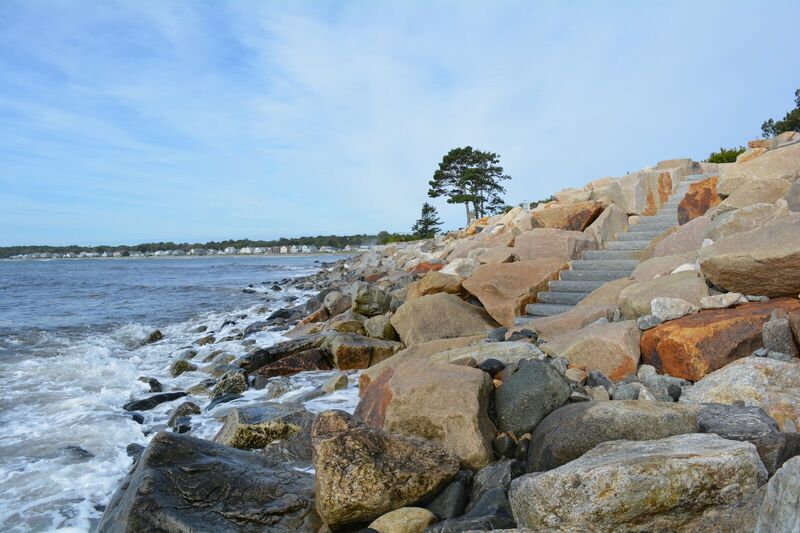 Granite steps provide a sturdy, beautiful option for entrances and walkways that can withstand harsh coastal elements for years to come. Whether as a welcoming entryway to your home or a beautiful backyard feature, granite steps can transform any outdoor space. 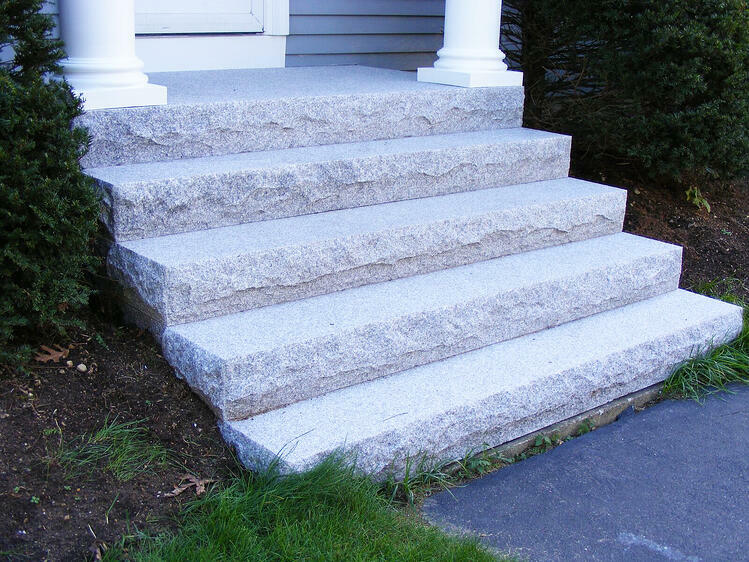 LEARN HOW TO CHOOSE AND INSTALL THE GRANITE STEP STYLE THAT’S RIGHT FOR YOUR HOME. 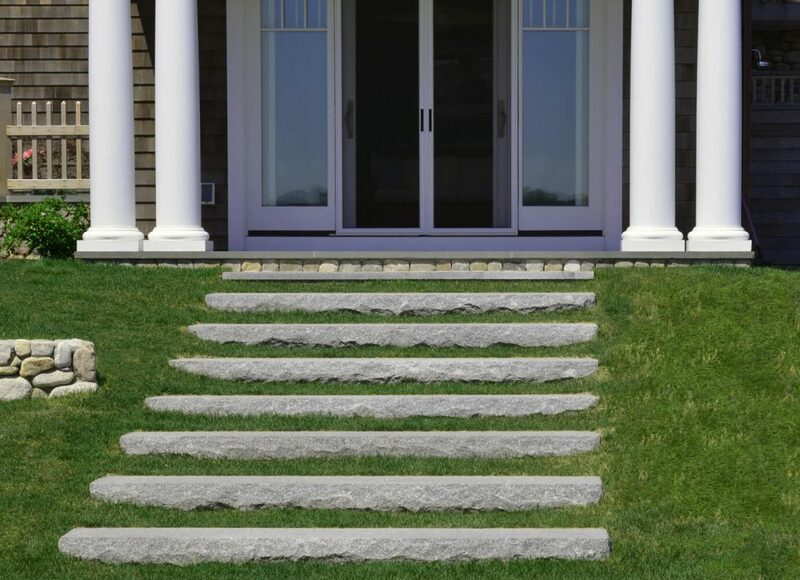 These Woodbury Gray granite steps create an elegant yet natural entryway to the home. 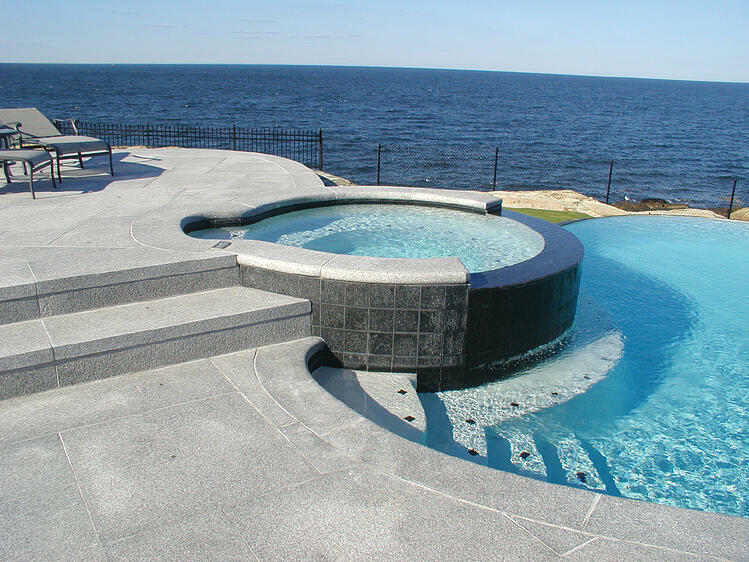 Woodbury Gray rock face granite steps cascade from the pool house to the pool at this Fishers Island, NY home. With grass in between the risers, the stairs create a natural look and feel. This oceanfront home in Rye, NH features a Woodbury Gray granite step staircase leading from the backyard into the ocean. Constructed by Great Works Landscape, the steps were custom built into the granite boulder retaining wall. While coastal pool patios made of concrete and other materials can be susceptible to weather-related damage, granite coping and decking can offer a durable, customizable alternative. Long-lasting Woodbury Gray granite coping and custom-cut pavers create a charming yet sophisticated pool patio. The project was installed by Great Works Landscape in Rye, NH. Water cascades into the in-ground pool from this tranquil spillover spa with a stunning ocean view. The design features Woodbury Gray granite coping and decking. 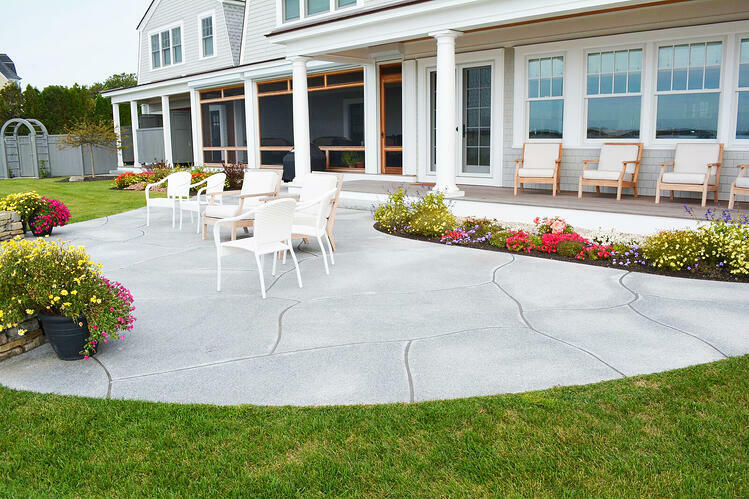 Granite is often a preferred material for coastal patios and walkways due to its low-maintenance and sturdy quality. Great Works Landscape installed custom-cut Woodbury Gray granite pavers at this home in Rye, NH. Woodbury Gray granite patio pavers create a simple, elegant patio design at this coastal home. An engraved compass adds an artistic, nautical touch to a classic Woodbury Gray granite walkway. Stone walls, whether freestanding or retaining, act as both stunning design elements and functional barriers in coastal homes and beach houses. When it comes to choosing the stone, there is a wide range of possibilities. Homeowners have the option of choosing regular or thin wall stone to construct a freestanding or retaining wall. While regular wall stone is thicker, larger, and blockier, thin wall stone is only 1-3 inches thick. The most common stone options include granite, quartzite, and fieldstone. While granite and quartzite provide a clean appearance, fieldstone is weathered and often has moss and lichen covering it, giving newly constructed walls an aged appearance. LEARN HOW TO ADD DIMENSION TO YOUR PROPERTY WITH STONE WALL DESIGNS. 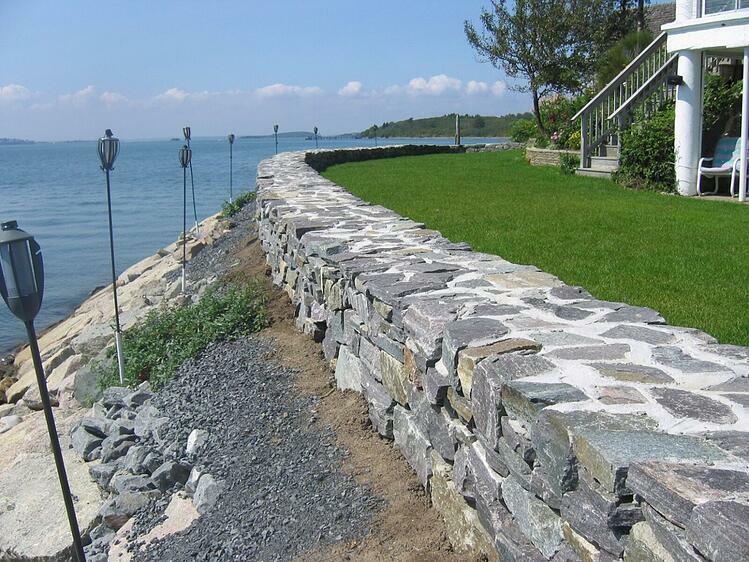 This retaining wall creates a stunning divide between the lawn and sea wall. Made from Saratoga granite regular wallstone, the wall ties together the design of the home with the natural elements surrounding it. This Rye, NH house features custom cut Woodbury Gray granite pavers in its oceanside patio, as well as a wall made from Old New England fieldstone. Project by Great Works Landscape. Woodbury Gray granite steps and New England style fieldstone combine to create this beautiful stairway entrance. A popular classic for coastal homes, cedar provides a beautiful, long-lasting, and low-maintenance exterior. Both traditional cedar siding and cedar shakes are common favorites among seaside homeowners. “Its high oil content gives it a natural resistance to water which helps keep it from breaking down due to moisture,” explained Fortress Deck. While cedar can be prone to splintering due to sun exposure, regular staining and sealing can keep cedar in excellent shape for over a decade. 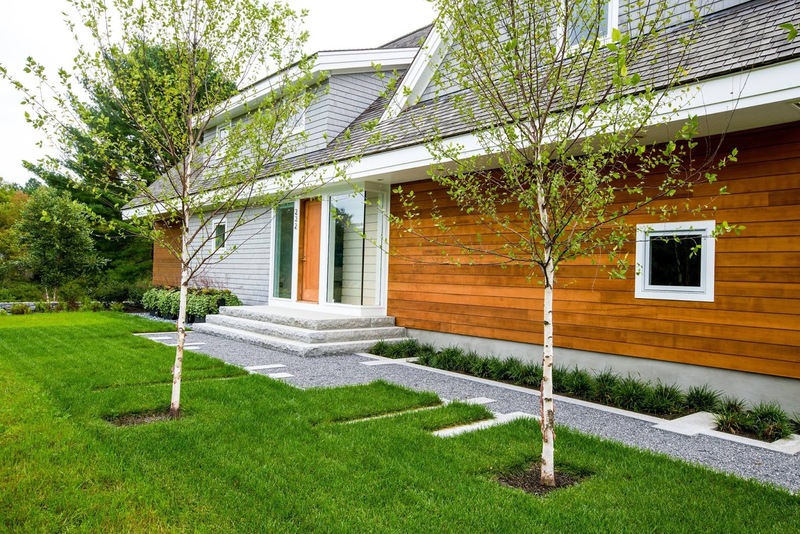 Cedar siding provides a beautiful contrast to the lush green surroundings of this beautiful Andover, MA home. Tiered Woodbury Gray granite steps, as well as a matching Woodbury Gray granite slab border, surround the entrance. Project by Andover Landscape. This Fishers Island, NY home reveals the natural beauty of clear, untreated red cedar shakes. Please note, cedar is not sold by Swenson Granite Works. Durability is just as important as appearance in order to ensure long-lasting, low-maintenance materials. Though a bit of extra care is required when designing your coastal home, choosing the right materials today can help you build a beautiful, long-lasting house for decades of future enjoyment. Swenson can help you choose the best products based on your home, location, and design preferences. 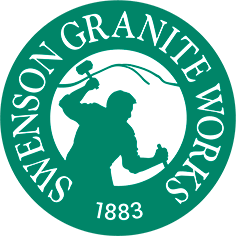 Discover backyard inspiration for your coastal home by downloading Swenson Granite Works Pools and Patios Inspiration Guide here.